Come on out and hit the ball. Tennis builds fitness and confidence, connects you with new people, and most of all, it's fun! Join us for fun on and off the courts. Tennis is all about love. Tennis is for all ages. The Sunshine Coast Racquet Club is a non-profit organization, managed and operated by its members who financed and built this great facility along with the support of the District of Sechelt. The only indoor tennis facility on the Coast, hours of volunteer work go into the operation of the club that benefits the entire Sunshine Coast community. We are all about tennis – our certified coach provides lessons for all ages and levels, there are fun leagues, a variety of tournaments to test your skills (some open to the public), plus social events from casual play and pizza nights to our famed fundraising pub night. 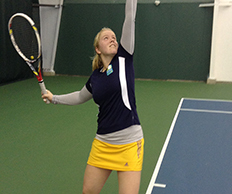 SRC is proud to support a youth tennis program – check out our Sponsorship Program. New members are welcome! Courts are also available for public play, so come and check out our facilities! The Suncoast Racquet Club is now on Facebook and Twitter, check us out!